We're getting ready to start our next Zumbini Sessions at Fit Happenz, LLC! Zumbini is an early childhood, music and movement program for newborns to age 4, with a caregiver. We’ll all dance and sing together in a class that’s fun, energetic, and engaging for you and your little one! If you attended one of the demos, you know how much fun this program is! >Plush Toy of the main character from the session! I know sometimes it seems daunting to sign up for a session of classes, but let me tell you, when you come to class every week, you’re really going to see your child blossom and grow. If you and your child come every week, once a week, they actually begin to learn to grow. They learn to be in a group, to anticipate the next moves, to help put away their instruments, and to love music. 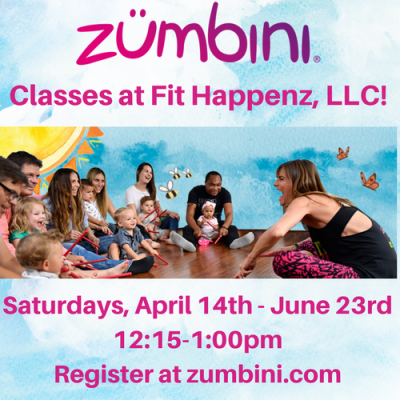 Can't wait to see you and your little one at Zumbini!